I took 5 months off my project of photographing everything I ate (I know you missed me) - but I'm back, and since I'm doing the videos on a monthly basis and not a weekly one, the videos are going to have somewhat more interesting content. I'm skipping the mundane - the bag of chips, the pint of Metamucil, the morning cup of coffee. I'm also having a little more fun with photography, trying different filters (I dumped the Blackberry and got an Android phone), and different angles. You may notice duelling bottles of hot sauce, I'm working on an article called "Rooster Vs. Rooster," which pits the Thai-style Sriracha against a Louisiana hot sauce called Red Rooster. Stay tuned. A Chelada is the name for the drink when you add lime and salt to a beer. Sometimes people add hot sauce, herbs and spices, sometimes tomato juice, sometimes even Clamato. They are also called Micheladas and what you may have gathered by now is that they're no real rules beyond salt and lime. Well, ever since the weather started to warm up here in San Diego, we've been making more and more cheladas. So when Honeysuckle White approached us to come up with a grilled turkey recipe, Chelada Turkey Tacos came immediately to mind. They sent us the turkey and they even sent us a Flip HD camcorder to make videos. Boo-yah! The Chelada Turkey Tacos encompass four recipes: the Chelada brine, a Roasted Corn Salsa, the Chipotle Sour Cream Sauce, and Alfredo's Tortillas. Make each separately and assemble them to order, grill-side, for some delicious summertime BBQ-ing. Chelada Brine from Papawow on Vimeo. Once the meat has spent 2-3 hours in the brine it is ready for the grill. Place the meat on a hot grill and cook, turning occasionally until the meat is done. This can be anywhere between 25-45 minutes depending on the thickness of the meat and the temperature of your grill. Turkey should be cooked to an internal temperature of 180 degrees F.
When the turkey goes on begin to roast your corn and red bell pepper for the Roasted Corn Salsa. Go ahead and shred some cabbage and prepare the Chipotle Sour Cream Sauce also. Make sure to keep the sour cream sauce in the fridge or cooler until it is ready to serve. I'll be honest, the star of this recipe and the key to making them absolutely amazing is "Alfredo's" tortillas. Alfredo was a guy in Mexico who taught my friend's father the technique of dipping the tortillas into a dressing before you grill them. There is nothing quite like it. We didn't make Alfredo's exact recipe, we modified it to pair more closely with the Chelada turkey but the technique remains. Below is our recipe and at the end of the post I will give the original Alfredo dip. Simply dip the tortillas into Alfredo's for 2 seconds on each side before throwing them on the grill. Cook them, turning once, for about 60 seconds a side. Plate and fill with toppings for tacos or burritos. Mix all of these together and set aside in a bowl. This is a wonderful universal salsa that goes great on almost everything. Incorporate all of the ingredients and fill a squirt bottle with them. You may need a funnel to fill the bottle. Keep the sauce refrigerated or in the cooler until you are ready to eat. How to assemble a Chelada Turkey Taco from Papawow on Vimeo. Once the turkey is done, shred it into bite-sized pieces. Shred some cabbage. Dip a tortilla, grill for a minute or two, add some turkey, the cabbage, the Roasted Corn Salsa, and squirt some of the Chipotle Sour Cream Sauce on top and you have yourself a Chelada Turkey Taco! We are moving from San Francisco and had to clean out the cupboard. What we aren't taking with us we are going to have to toss, donate, or give to friends. We will donate the non-perishable, canned, sealed, jarred, etc. That which was un-donate-able (opened) but otherwise still quite delicious will be passed on to friends in the neighborhood. Here is a collection of what we will miss. Oh, contrary to popular belief, chocolate does go bad. Especially white chocolate in this house. We've all likely been there. At the BBQ, camping, or maybe on a boat. There sits the bottle of wine... and no one brought a corkscrew. The thoughts that go through people's heads. The tools they use. We humans are very creative creatures, especially when there is booze involved (think Legend of Zelda-themed party ice luge). There's the Wikihow on how to open a wine bottle without a corkscrew. They illustrate a technique using a screw, a screwdriver, and a pair of pliers (pulling it out, caveman-style) or a hammer (using a first-class lever which is much more civilized). 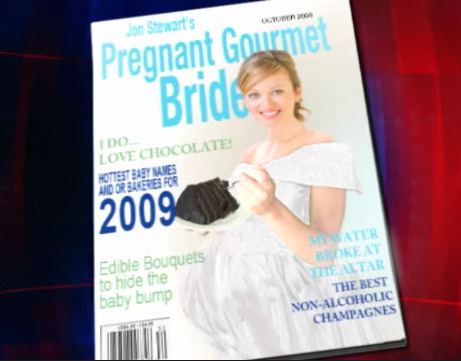 Jon Stewart gives Condé Nast some advise. Combine all four magazines that they are cancelling: Elegant Bride, Modern Bride, Cookie (a parenting magazine) and Gourmet into into one super mag. Western Spaghetti was voted by Time Magazine as the #2 Viral Film of the Year for 2008. The company who made it is called PES and they have done some some more well known commercials for products like Scrabble, Sprint, Coinstar, and Bacardi. A Cure for America's Obesity Problem? If you haven't heard if Improv Everywhere yet, this is a great example of what they do. They are self-described as, "[causing] scenes of chaos and joy in public places. Created in August of 2001 by Charlie Todd, Improv Everywhere has executed over 80 missions involving thousands of undercover agents." Here is another [non food-related] example. Buy their book, Causing a Scene: Extraordinary Pranks in Ordinary Places with Improv Everywhere for as little as $9.99 via Amazon. Called a viral mini-epic short film about war, Food Fight is the work of Stefan Nadelman of Tourist Pictures. He has done many ads and short flicks, some of which can be watched on his website including spots he's done for, Saturday Night Live, Volkswagen, Maple Leaf Foods, and Mike & Ike candy. Food Fight takes through some of the more infamous moments of WWII all the way up to the United States' current conflicts in the Middle East. Pretzels gun down matzo with their salt. Hamburgers destroy everything by shooting their pickles. Sushi rolls turn into kamikaze. It'll make you laugh, it'll make you cry, but in the end Food Fight shows us how fear for food safety... well, fear for our food's safety. Stefan Nadelman is primarily in the field of motion graphics for film, music videos, and broadcast. Tourist Pictures is located in Portland, Oregon. Pop up some popcorn and enjoy the show. Snap, Crackle and Pop are all brothers and they are elves. They were adapted from Kellogg's radio ad and were first illustrated by Vernon Grant in 1933. Snap is the oldest and is the problem solver, fixing what his two brothers create. Snap sports a chef's hat. Crackle is the fun-loving middle child. Crackle is also the leader of the group and the supposedly, smartest of the three. Crackle wears a red-and-white-striped hat. Pop is the jokester, youngest elf; Pop doesn’t take anything seriously and he wears a band leader's hat. According to Mental Floss Magazine (2008) "A Second Helping of Cereal Facts" there was a fourth brother, Pow. - "In the 1950s, [Pow] was supposed to represent Rice Krispies’ explosive nutritional value. Sadly, four proved to be one cereal gnome too many, and Pow was given the pink slip." Belgium - Pif! Paf! Pof! Canadian French - Cric! Crac! Croc! Denmark - Pif! Paf! Puf! Finland - Poks! Riks! Raks! Germany - Knisper! Knasper! Knusper! Holland - Pif! Paf! Pof! Italy - Pif! Paf! Pof! Mexico - Pim! Pum! Pam! Norway - Piff! Paff! Puff! South Africa - Knap! Knaetter! Knak! Sweden - Piff! Paff! Puff! Switzerland - Piff! Paff! Poff! United Kingdom - The mascots were portrayed, for a while, as cows instead of gnomes. From the folks who brought us the Guacamole Song, Rhett and Link, comes the BBQ song. I wish I had enough talent to write funny jingles about food... oh, that would be the life. These two are quite talented and, I believe, are even sponsored by Alka Seltzer. Brilliant! Best quote from the song? their barbecue sauce is WHITE, made out of mayonnaise"
The Associated Press reports that Austria's health ministry found detectable traces of cocaine samples of Red Bull Cola energy drinks... keep in mind that this is Red Bull's Cola and not their ubiquitous Energy Drink. They use the Coca leaf as a flavoring but are supposed to remove any cocaine. Before you go out and buy a case, Red Bull Spokeswoman says that any traces are very slight and do not pose a health risk; and the company maintains that its Cola is "harmless and marketable in both the U.S. and Europe." So how much did they find? - 0.4 micrograms/liter. To put things in perspective, the EPA allows a maximum threshold of arsenic in drinking water of 10 micrograms/liter. That's 25 times more than how much cocaine the Austrians found. Author Michael Pollan goes on the Colbert Report to explain how the food-industrial complex is destroying what we eat by processing and synthesizing it. He opines on how reducing a complex food down to a single component is fundamentally detrimental to our health. One of the tenets of his newest book, In Defense of Food: An Eater's Manifesto , is to only buy things with "5 ingredients or less." He is steadfast that this is the most simple method for reducing the amount of synthetic food in our diets. Interestingly, I recently tried Häagen-Dazs' new ice cream that is actually called five. They boast that it only contains five ingredients: milk, cream, sugar, egg yolks... and then whatever flavor it is. They make it in make Mint, Coffee, Vanilla, Ginger, Passion Fruit, Brown Sugar, and Chocolate and it's good! Some of the highlights of the Colbert clip include Michael admitting to eating Yodels; how he got "busted" at the supermarket buying Fruity Pebbles, and he blasts infant formula but his mom is in the audience - and she tells him that he wasn't breast fed. Zing! Can You Tell Pâté from Dog Food? "Considering the similarity of its ingredients, canned dog food could be a suitable and inexpensive substitute for pâté or processed blended meat products such as Spam or liverwurst. However, the social stigma associated with the human consumption of pet food makes an unbiased comparison challenging.